In 2009, on a beautiful sunny day, Megan Devine witnessed the accidental drowning of her beloved partner Matt. "All my professional experience as a therapist felt meaningless," she writes. "Grief literature is loaded with well-intended advice that can actually worsen and extend someone's pain. We just don't know how to handle loss in our culture." Megan has dedicated herself to helping people find a new way to deal with loss that honors our experience without trying to "solve" grief. 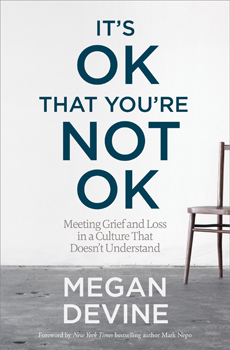 With It's OK That You're Not OK, Megan reveals a path for navigating grief and loss not by trying to escape it, but by learning to live inside of it with more grace and strength. Through stories, research, life tips, and mindfulness-based practices, she offers a unique guide through an experience we all must face. Here she debunks the culturally prescribed goal of returning to a normal, "happy" life, replacing it with the skills and tools to help us experience and witness the pain of loss in ourselves and others - so we may meet our grief knowing it to be a natural step in the greater journey of love.